Many people start following the Paleo diet in a bid to feel healthier and more energetic. And while you might read endless stories of Paleo devotees who recount inspirational stories of improved health, clearer thinking, better sleep, greater productivity and the boasting of such massive energy levels that they actually want to exercise, it doesn’t always happen. It’s a clean diet. Since the Paleo diet advises against the consumption of processed foods, the diet is free from high fructose corn syrup, trans fats, monosodium glutamate, fake fats or artificial sweeteners. Numerous studies have linked these food additives to weight gain, accumulation of body fat, blood glucose spikes, increases in cholesterol and triglyceride levels, worsened inflammation and higher risks of certain cancers. It’s rich in healthy fats. If you’re on the Paleo diet, you’ll be regularly consuming fish, seafood, seeds, olive oil and avocados. In other words, you’ll be ingesting a nice blend of omega-3s and omega-9s, fatty acids that have been shown to improve heart health, reduce inflammation (and all the conditions that come with it) and slash cancer risks. Plus, these fatty acids are also essential for the absorption of the essential fat-soluble vitamins A, D, E and K.
Paleo meals are really filling. Rich in fiber, healthy fats and lean proteins, a proper Paleo meal should keep you satiated for a few hours without sugar cravings lurking around. So let’s start troubleshooting. If you’ve stopped drinking caffeine, stopped smoking, started exercising or made any other drastic lifestyle change, it might not be the Paleo diet at all. If the Paleo diet is the only thing you’ve changed recently it’s time to turn to your diet. Sugar, grains and dairy are addictive and can influence your brain chemistry by crossing the blood-brain barrier where they act as opioids 1. If you recently went Paleo, it could be that you are experiencing withdrawal symptoms as your body learns to adapt without these substances. Plus changing your whole diet requires strong will-power especially if you’ve ‘thrived’ on the Standard American Diet for years. This can be both emotionally and physically draining. What you can do about it: Hang in there and be patient (think of all the health benefits you will reap if you do) – any side effects you’re currently experiencing will pass and you’ll wonder why you ever considered donuts as a food. 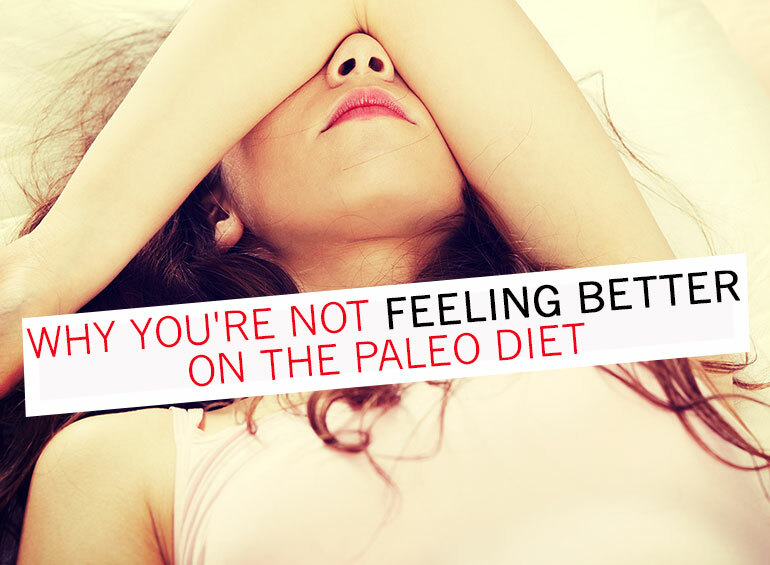 If you’ve gone Paleo for a while now and you still feel tired all the time, it could be that your diet is carb deficient. Yes, that’s a thing and if you don’t consume sufficient carbs, your brain will be sluggish and it will be hard for you to work out for more than a few minutes – your brain and muscles depend a lot on carbs for energy. What you can do about it: Eat some Rice Krispies? Definitely not. Instead choose healthy carbs from sweet potatoes, fruits like bananas and avocado and root vegetables. Once you start the Paleo diet which is naturally low in carbs, your body will start using more fat for energy. However, if your diet is low in both fat and carbs, you may not be able to meet your body’s energy needs. What you can do about it: Add some avocado, chopped nuts or cold pressed extra virgin olive oil to your salads; sauté your veggies in some grass-fed butter and/or add some virgin coconut oil when cooking meat, fish and seafood. Caution: If you’ve had your gall bladder removed or if you’ve been on a low-fat diet for a long time, gradually increase your fat intake so that your body has enough time to adapt and release sufficient digestive enzymes. Suddenly increasing your fat intake could cause indigestion, heart-burn, diarrhea and bloating. A drastic reduction in your carbs intake can have a diuretic effect on your body. This might happen if you’ve been on the Standard American Diet for a long time and recently switched to a Paleo diet. What you can do about it: Drink more water – as a guide, your urine should be clear or pale yellow and odorless. If you’re not a fan of drinking plain water, spice it up by adding some crushed mint leaves, chopped cucumber and some lemon wedges. Or you could also add some frozen fruits or fruit puree. If you’re on medication your meds may need to be re-adjusted: Contact your physician. If you’ve been suffering with irritable bowl syndrome (IBS) digestive issues and they’ve worsened on the Paleo diet, you might be suffering with a food intolerance. The Paleo diet is rich in healthy foods, but that doesn’t mean it agrees with everyone. Food intolerances and sensitivity such as oxalate sensitivity and histamine intolerance, mean that eating a diet high in fruit and vegetables can worsen symptoms. Histamine intolerance can produce IBS type symptoms and chronic fatigue, is well established and accepted by allergy researchers, but almost entirely unknown amongst doctors. What you can do about it: See your doctor. Most food intolerance and food sensitivities can be managed by avoiding the the offending foods. The difficulty is diagnosing the food intolerance or sensitivity in the first place as symptoms can sometimes be all over the place. For intolerances such as histamine intolerance there might be enzyme supplements available. Suffering with a food sensitivity or intolerance doesn’t mean that you need to abandon the Paleo diet entirely, but that it will need some tweaking to address your body’s unique needs and sensitivities. Bacterial overgrowth is thought to be another common problem, which can cause digestive symptoms and fatigue for which you can follow a low FODMAP version of the Paleo diet. Don’t think of it as the Paleo diet, but as the Paleo template. That applies to everyone. We’re all similar, but each of us is still unique. So each of us needs to adapt the Paleo diet to suit our individual biology to ensure we get the absolute best results. 1. Fukudome, S. I., & Yoshikawa, M. (1992). Opioid peptides derived from wheat gluten: their isolation and characterization. FEBS letters, 296(1), 107-111.